Customize this awareness ribbon keychain to the color you desire, and add any other graphics you choose to promote your cause. These keychains are great for fundraisers or event giveaways. Great to promote your car dealership, a car show or other event, this little car keychain can be personalized in full color with the graphics of your choice. At a very budget friendly price point, it's perfect for a promotional give away. 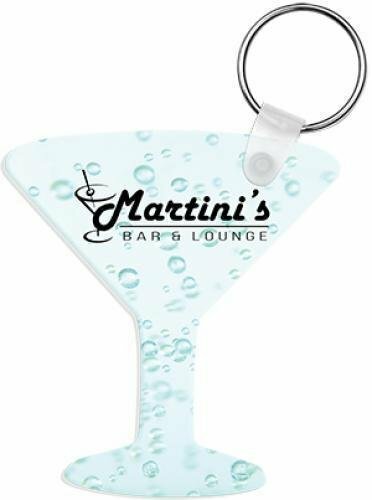 This martini glass keychain can be personalized with a logo, photo, or other full color graphics. It's a unique, budget friendly way to promote your business, or to commemorate a special event. Personalize this shamrock keychain with your logo for a great way to promote your establishment. Add a favorite photo for a memento of a special event, or a budget friendly souvenir. The uses are unlimited, just use the full color graphics of your choice to create the keychain that will fit your needs.